"The Machine" is a poorly constructed amalgamation of every robot Artificial Intelligence story we've already seen. It borrows from just about all the expected sources, in particular "Blade Runner" and "Robocop," without making the reanimated AI robot interesting at all. It barely takes the time to pause and ask the difficult questions of "Ex Machina," and in typical fashion the man made robotic creatures have more heart and soul than the humans who created them. Worse yet, the film feels like it's stretching hard at times to tie in all its references, which feel more and more nonsensical the more we stop to think about them. There's also a touch of the dystopian future genre at play, as the entire film takes place in a military compound run by ruthless officials with drastic plans to create weaponized, humanoid robots with which to unleash on China, who is the U.K.'s opponent in a new Cold War. Driving the science behind the robots is Vincent McCarthy (Toby Stephens a veteran of the small screen, most recently known for "Black Sails"), a scientist developing AI for these robots, with the personal goal of developing a brain implant to cure his daughter of her mental illness. His test subjects are ex-military men who've suffered brain damage, or even died during battle. Vincent's high tech brain implant brings them back to life, yet has a peculiar side effect that causes their speech patterns to become an unintelligible, electronic garble. The aforementioned "Robocop" reference occurs when Ava (Caity Lotz), Vincent's new assistant, is killed by a Chinese spy attempting to gain entrance to the compound. However, her reanimated robot body, constructed of impenetrable skin made to look and feel like human skin, shares only her likeness, rather than any of her personality or past memories. Which consequently means she lacks the depth that made Robocop a compelling character. Nevertheless, Vincent, having brought her to life with his new technological breakthrough, is supposed to spend much of the rest of the film determining whether or not she's a conscious AI, when he's not dealing with his numerous other distractions. However, what makes this film turn into a rebellion against a dystopian government is the primary villain's (Dennis Lawson) nonsensical rebellion against the plot of the film. The military's mission was to create AI soldiers to send into battle, but when writer/director Caradog James decides he wants to end the film with a fairly poorly executed action sequence, he decides to kill that AI stating that true AI is too dangerous, despite being the one in charge of its development. James' writing credits include a couple of short films before making the jump to this feature length film, and many rookie mistakes are on display. It lacks necessary tact, instead relying on large amounts of "on the nose" dialogue that says everything we should be thinking or feeling at any given moment. Despite having very little action till toward the end, things still seem to move too quickly and happen very abruptly allowing very little time to breath. Even the scenes that should play for emotion and sympathy are over in a flash. 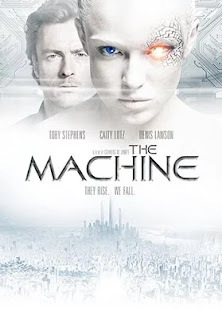 Worse yet, the acting is not convincing, particularly that of Caity Lotz's Ava (seems like a popular name for an AI female, see "Ex Machina"), and it only gets worse when they turn her into a machine. She uses an over-the-top wide eyed gaze (which they color a glowing blue for added effect), and her voice is an exaggerated childish high pitch. Unlike "Ex Machina" where the AI character is well aware of who and what she is, here she's written and portrayed as a childlike robot experiencing the world and human interaction for the first time. Although she never thinks she's human, she is convinced she's alive, she just has to make Vincent believe her. And while this concept is the most interesting the film has to offer, there's only a couple of scenes devoted it. It's supposed to make him grapple with the question of what life is. Does the fact that she isn't made of human flesh make her any less alive than a human? However, it doesn't make as convincing a case as "Ex Machina." This decision to portray her in such a childlike fashion, with a fear and respect of human life, seems to undermine the scenes later on when they are building her into a ruthless killing machine. The two extremes are such polar opposites that the character feels extremely inconsistent and often at odds with itself. About the only thing James does particularly well is establish his darkly moody tone, yet even that seems borrowed from previous films. A big part of it is the moody, reverberating, electronic score that is very reminiscent of "Blade Runner" and "Mass Effect." This is a case of subject matter and concepts that are far more interesting than anything James aspires to do with them. The relatively short hour and a half runtime feels like a constraint on substance, which was lost in favor of making its numerous references. It's so hamstrung by its inspirations that it's never allowed to become something unique in and of itself.